Maytag MHWE250XL Performance Front-Loading Washing Machine, 4.0cu. ft. This front-loader with the IEC Equivalent Capacity has 12 wash cycles including the 2 wash options with the Exclusive MaxExtract Extended Spin. Its front controls consist of digital knobs and buttons, end-of-cycle alarm and Add-A-Garment indicator. A 10-year limited warranty for the motor and basket is included. The washer’s 12 wash cycles consist of the following: PowerWash, Heavy Duty, Whites, Normal Wash, Quick Wash, Comforters, Delicate, Silk, Clean Washer with Affresh, Soak, Rinse & Spin and the customizable My Cycle. The Extra Rinse option is ideal for bleach-treated whites, while the MaxExtract option is an extended spin cycle to cut down drying time. Its three-compartment dispenser distributes the necessary amount of detergent, bleach or fabric softener at the right time. The basket is made of commercial-grade stainless steel and spins with a maximum of 1200 rpm. The size of each load is matched with the necessary water level with the help of the IntelliFill Automatic Water Level Sensor. The IntelliTemp Automatic Temperature Control automatically adjusts the temperature of the water. 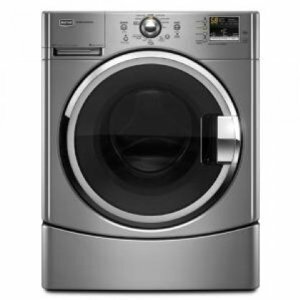 The washer’s large, circular door has a heavy-duty door handle with rubber-coated inside. Its control panel with digital knobs and buttons sits right above the door, making access easier. The control panel has an estimated time remaining display, Add-A-Garment indicator, and adjustable End-of-Cycle signal. The unit can be installed in different ways. It can be used as a freestanding washer, a built-in appliance, or stacked with a matching dryer to save space. It can be also used with the optional pedestal to minimize back strain. The washer’s 12 cycles include the personalized My Cycle. Equipped with the QuietSeries 300 Sound Package, the washer guarantees noise-free operation. The estimated remaining time is displayed in a small LED monitor. Its basket is made of rust-proof commercial-grade stainless steel. Right amount of detergent, bleach and softener are dispersed by the washer’s 3-tray dispenser. The large door is made with heavy-duty door handle and attached with die-cast hinge. The basket and motor come with a 10-year limited warranty. Steam is valuable in cleaning the clothes. However, this washing machine does not use steam in any of its cycles. The washer’s door is not reversible, making any future improvements almost impossible. Unlike other models, this unit does not have a built-in heater. It has no NSF-certified Sanitize temperature setting.